Should they be dead or green? Is spinning or scraping more efficient? There are many, many ways to make a fire. Some require more skill, while others depend on carefully prepared equipment. The closest thing to "rubbing two sticks together" is the hand-drill. 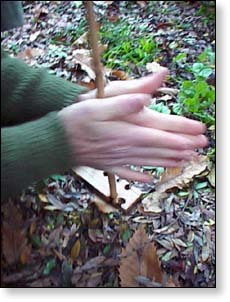 You will need a fireboard (a small cedar board is good) and a thin, straight stick. A knife is good, too. This takes a lot of practice. Hand callouses help. YouTube has many videos: Fire Plow (YouTube). Even further on the skill end of the scale is the fire plow. Basically you push a stick along a groove in a board. I've heard that native people of the Pacific Northwest would walk up to a cedar tree, cut groove in the side of the tree, and plow up a coal right there. Again, see YouTube: Fire Plow (YouTube). Each of these stages is its own set of skills to learn. Each is contextual (type of wood available, season, weather, etc.). Wet weather is especially challenging, so start learning when it's not raining. However, watch out for your dry season, when runaway fires are particularly risky. Check with your fire department for burn bans. There is no mastery of fire-making. Sometimes, when you're sure that you're doing everything right, you still can't get a good fire going. Consider it a spiritual practice. I suggest using a bow drill. It's a little tricky to start, but once you get the hang of it you can get pretty good at it. You should be able to press into the wood. If you can't at all then it's too hard. However, if you can make a fingertip-sized depression then it's too soft. Make sure there isn't any sap in the wood. Types of wood to look for are sycamore, willow, and dogwood. Here's a good site with step-by-step instructions for constructing a bow drill set. A tip I learned from a buddy: put sap on the end of the spindle that is not doing the drilling. That way it doesn't make a fire in your hand piece. I have successfully made friction fires before, and it is possible. That said, it is not easy. I would reccomend leaning the bow drill. Use basswood, western red/eastern white cedars, poplar or cottonwood, among others. It is easier than other methods, but still requires a lot of practice. When I was learning the hand drill, I practiced EVERY DAY before I got my first ember. Practice often! I've seen so-called fire starting "experts" who say they can start a fire with sticks using a spindle or bow, but it almost never works in real life. They usually have a board with special notches or holes (which you won't find in the woods) and special wood. If you're in a survival situation where you need to make fire, these methods are usually too complicated, require too many specific things you won't find in nature, and very time consuming to assemble and use. Just pack a few lighters and keep them on you at all times. Not the answer you're looking for? Browse other questions tagged survival fire-starting or ask your own question.